>Buddy Bear Bottoms are made by a work at home mom, and sold on Hyenacart. P.S. Read here if you’re curious about the website name. Sellers do not stock items continuously, and beause of the nature of the items/craft, diapers are often one of a kind or limited. I hesitated too long on the diaper I really wanted from Heartland Dreams and it sold. I was really disappointed and kept looking at this one. I finally told myself that if it was still there when I got home (I was at the grocery store at the time), I was buying it! It was, and I did! I love little touches like that adorable piece of yarn tied in a bow, but it scared me for a second. I thought, oh no!! I didn’t mean to buy a girly diaper with a bow on it! Oh well, maybe hubby won’t notice! Don’t worry, I’m not that stupid, it only took me a second to figure it out. Hee hee. 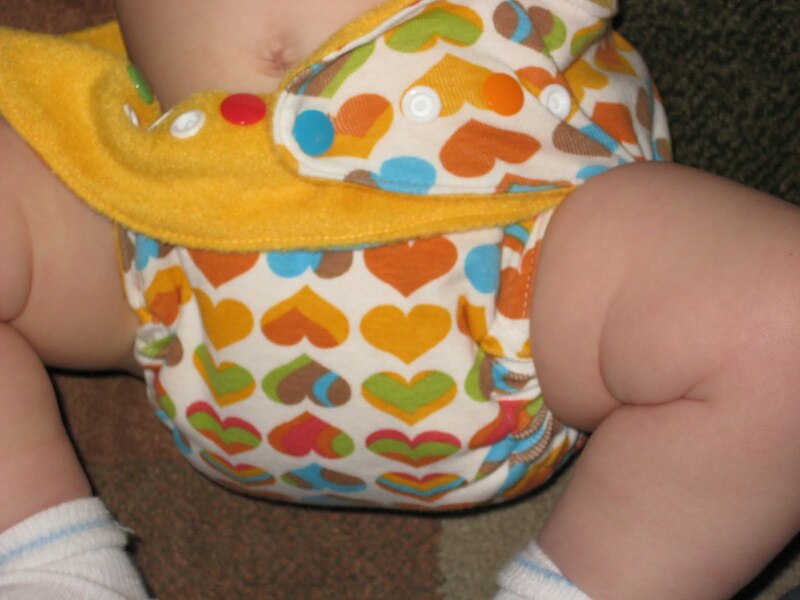 This is a fitted diaper, which means it does not have a waterproof layer, and should be used with a cover. They’re wonderful because they are so breatheable. You can put your baby in a shirt, diaper and babylegs and just change often, rather than using a cover. Then you don’t cover the adorable diaper. 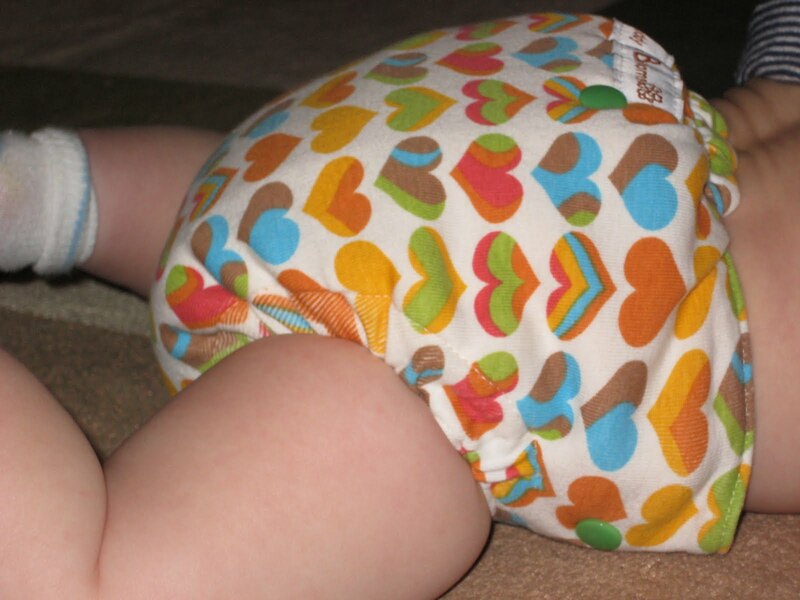 Some of the cutest diapers and prints are fitteds. They look so scrumptious stacked up. I just fell in love with this print. 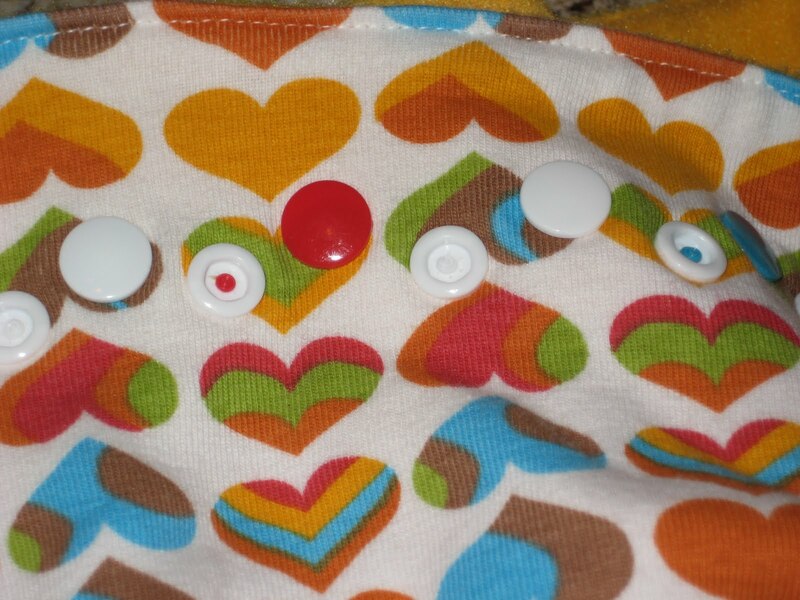 I know hearts are a little girly, but I think the colors make it boyish also. Right? Right? 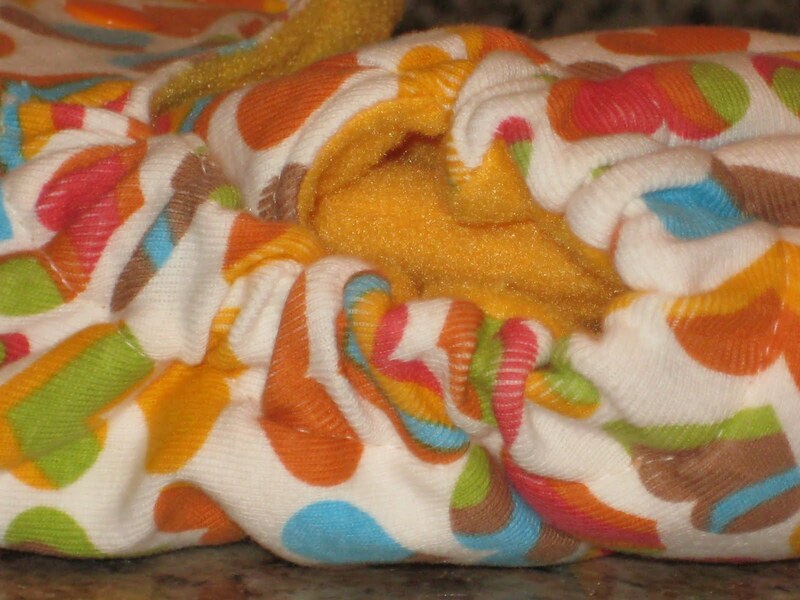 The diaper has a thick, squishy snap in soaker. 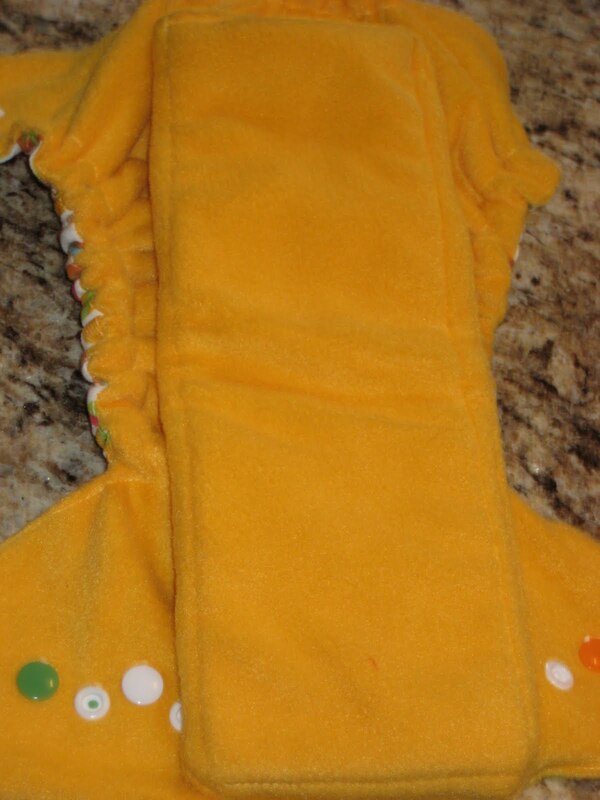 The soaker is made out of ZORB, the outer of the diaper is cotton knit, and the inner is anti-pill fleece. It took no time to dry. This is a one size fitted with a fold down rise. It has adorable color coordinated snaps. As well as an extra row of snaps on the inside, for folding down the rise. If you notice the snap on the right between the orange and green, you’ll see you can overlap the wings to get a snug fit. The weight guidelines are 10-35 lbs, which can vary baby to baby, as I’ve noted before. The max rise is 17″ and the max waist is 22″. It seemed to fit my 15.5-16 pound kiddo fine on the standard (unfolded) rise setting. However, it didn’t add much bulk to use the smaller setting with the soaker folded down. He had it on (no cover) for at least an hour and a half, if not more than two hours (I wish I had looked at the clock!) with no leaking and no wicking. The soaker was fairly soaked (hardy har har) so as I folded it and held it in my hand, I could feel some moisture seeping into the outer layer. I would probably use a cover in any situation where he’d be susceptible to compression (like in the car), but it’s a darn shame to cover up such a cute diaper at home! 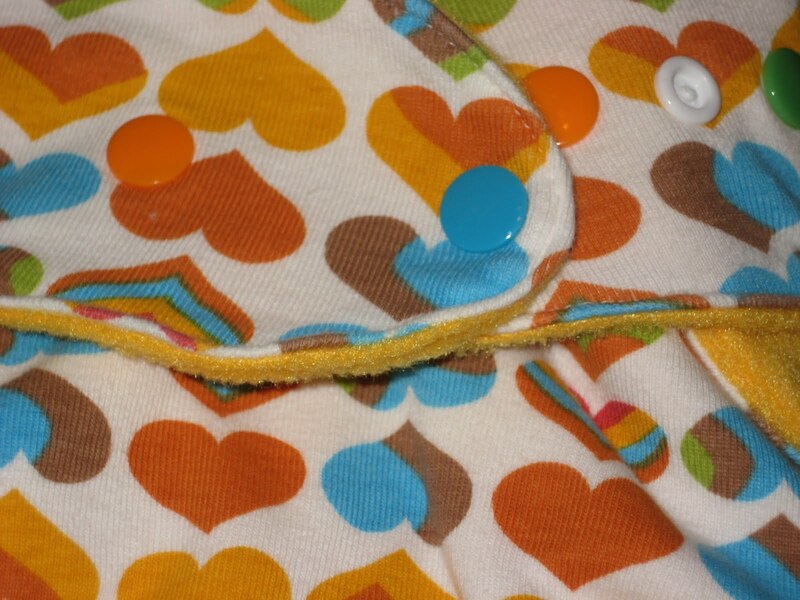 Although, the econobum cover is so thin, you could see the diaper right through it! 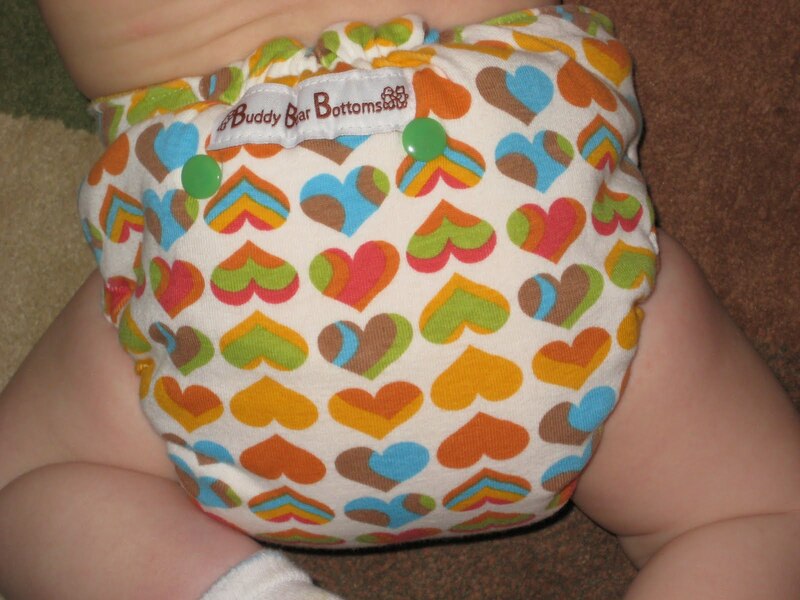 I wouldn’t hesitate to buy another Buddy Bear Bottoms diaper! Edit August 2010: I ended up selling this. Fitteds are not my preference for daytime use, and it wasn’t absorbent enough to hold up to my heavy wetter at night.